Dutch elm disease (DED) has been spreading across North America since the 1920s. It first was reported in North Dakota in Mandan in 1969, and it reached eastern North Dakota by 1973. DED has been confirmed in every North Dakota county. This disease is caused by two closely related species of fungi, Ophiostoma ulmi (Buismann) Nannf. 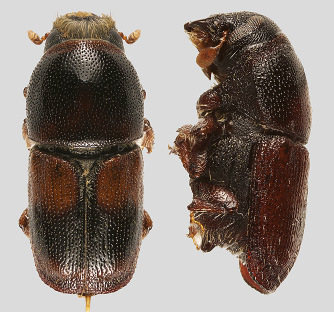 and Ophiostoma novo-ulmiBrasier, both of which are transmitted by bark beetles and through root grafts. All North American species of elm are susceptible, and no elm species is totally resistant to the disease. This disease is responsible for the death of the majority of native elm trees in the United States in the past century and kills a portion of the remaining elm trees every year. 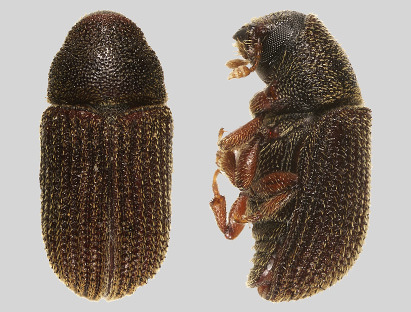 Three species of bark beetle (Coleoptera: Curculionidae) attack elm trees in North Dakota. 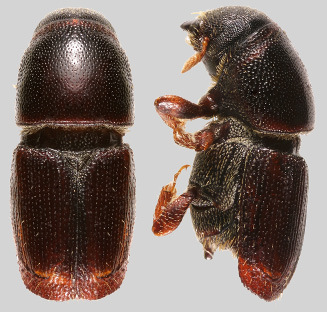 These three species are the native elm bark beetle (Hylurgopinus rufipes Eichoff), the introduced smaller European elm bark beetle (Scolytus multistriatus Marsham) and the recently introduced banded elm bark beetle (Scolytus schevyrewi Semenov) (Figure 1). These species are generally small and brown or black, with cylindrical-shaped bodies. Beetles move into a new area by flying short distances or being moved in human-transported wood, and may be blown in during storms. All three species of beetle are potential carriers of the fungi that cause DED and all occur in North Dakota. However, the smaller European elm bark beetle is extremely intolerant of cold temperatures and does not survive most North Dakota winters in large numbers. The native elm bark beetle is more common and important in the spread of DED in North Dakota. Recently, the numbers of banded elm bark beetles, trapped in North Dakota, have increased. The implications of this increase for DED are uncertain. Regardless of the species, when adult beetle populations are high, the risk of DED infection is increased. Symptom development varies depending on whether a tree was infected by the pathogen through beetles or root grafts. Trees infected via beetles first show symptoms of wilting, curling and yellowing of leaves on one or more branches in the upper crown (Figure 2). Large trees may survive only two or three years if the disease progresses rapidly, or they may survive for several years, with the number of wilted branches increasing annually. In the case of trees infected through root grafts, DED progresses much more rapidly; wilting often begins in the spring in the lower branches and progresses upward, leading to mortality during that summer and fall. If root grafts are present, elms adjacent to an infected tree usually show symptoms one or two years after the neighboring tree dies. The pattern of symptom development also can vary depending on the species of bark beetle spreading the fungus. The three elm bark beetles feed on branches less than 4 inches in diameter, with the smaller European elm bark beetle preferring smaller-diameter branches and twigs. Infections due to the smaller European elm bark beetle result in yellowing and wilting of leaves on small branches and twigs high in the crown. The yellowing and wilting then progress to larger branches as the infection moves downward. Removal of bark from these small branches and twigs will reveal brown streaking in the sapwood, which is a characteristic symptom of DED (Figure 3). Infections caused by the native elm bark beetle are initiated further down in the crown due to the beetle’s preference for feeding on larger branches. Symptoms usually appear as the wilting or browning of leaves of an entire branch or segment of a tree. Streaking will be present in the larger branches but not the smaller twigs. These infections begin lower down in the crown; by the time symptoms are noticed, the fungus usually has spread into large scaffold branches. The different patterns of disease development associated with the different species of bark beetle have important management implications. Figure 3. 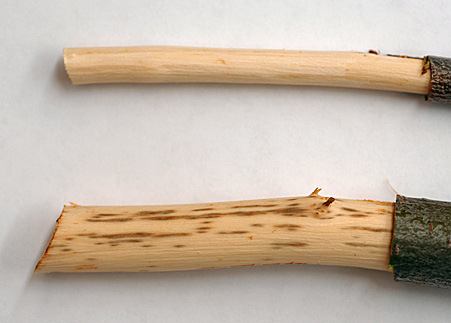 A healthy (A) and (B) infected branch of American elm. Brown streaking (B) is a characteristic symptom of Dutch elm disease. Native Elm Bark Beetle. Native elm bark beetles can overwinter as adults or larvae. In the spring, female bark beetles are attracted to dead and dying trees (such as those killed by DED) or to elm logs in firewood piles to deposit eggs. They burrow below the bark and create nuptial galleries along which eggs are laid. Eggs hatch into grub-like larvae, which feed by making tunnels (or galleries) in the tree. Feeding galleries typically run with the wood grain and at right angles to the original egg gallery, which extend across the wood grain. When larvae are mature, they pupate and emerge from the tree as adults in July or August ( Figure 1). If the tree was infected with DED, the fungus produces sticky spores in the galleries. When the new generation of adult beetles emerges from the tree, they carry these spores and transfer the fungus to neighboring healthy trees as they feed on the inner bark of branches. As winter approaches, beetles burrow into the bark near the base of living trees to overwinter. The following spring, the beetles will emerge, feed and lay eggs for another generation, potentially spreading the disease further. In North Dakota, native elm bark beetles typically have one generation per year that overwinter as adults or a partial second generation that overwinter as larvae. Smaller European Elm Bark Beetle and the Banded Elm Bark Beetle. The biology of the European elm bark beetle and the banded elm bark beetles differs from the native elm bark beetles by having two or more generations per year. Smaller European elm bark beetles overwinter as mature larvae in protected sites such as logs in the interior of firewood stacks. Banded elm bark beetles can overwinter as larvae, pupae or adults in the infested branches or trees, or in logs with bark attached. In the spring, adult beetles emerge and feed in the crotches of tender twigs. This feeding activity can result in multiple points of pathogen spore transmission to the tree. After feeding, females will fly to dead or dying elms and bore into the bark to lay egg galleries. Larvae hatch from the eggs, excavate larval galleries and pupate when mature. The egg gallery runs with the wood grain, whereas the larval galleries radiate out across the grain. After 35 to 40 days, the second generation of beetles emerges and the cycle continues. Root Grafts. Root grafting occurs when tree roots come into contact with each other and fuse together, creating a continuous vascular system. The DED fungus will produce spores that can spread from infected to healthy trees through this continuous system. The fungus can kill all the elm trees along the length of an entire street in this fashion. Several other diseases and abiotic disorders may cause wilting symptoms and the death of elm trees. To be certain that DED is killing an elm tree, the fungus needs to be isolated from infected tissue. For a small fee, samples can be submitted to the Plant Diagnostic Lab at NDSU for verification. Send samples to NDSU Plant Diagnostic Laboratory, Dept. of Plant Pathology, 306 Walster Hall, NDSU, Fargo, ND 58102. Several management tools for DED are available. Using them in the appropriate situations and combinations is the best way to reduce DED and limit its spread. Sanitation. A year-round communitywide sanitation program can be an extremely effective way to slow the spread of DED. Due to the fact that the beetles breed in dead elm wood with intact bark and in dying elm trees, removing these sources of beetle habitat is essential. This includes removing damaged branches following windstorms, trees weakened by pest attack and fresh elm firewood (all species of elm). Common ways of disposing of infected elm wood include burning, burying, chipping or debarking cut elm wood. For sanitation to work effectively, identifying newly infected trees every year and removing them promptly is essential. Failure to do so may result in a surge in elm mortality in the following years. A strong municipal ordinance that clears the way for communitywide sanitation on public and private property also is essential to this effort. Pruning. If infections are identified early enough, they can be removed by pruning. At least 8 to 10 feet of wood that is free of vascular discoloration needs to be removed below the symptomatic branches. Pruning should be conducted October through March. These pruned branches should be destroyed immediately. Remember to disinfect pruning tools with a 15-20 percent household bleach solution after exposure to DED-infected trees. Due to the uncertainty of pruning out all infected wood, trees pruned in an attempt to remove DED-infected branches should be monitored closely for the development of symptoms below the pruned area. Severing Root Grafts. To limit the spread of DED through root grafts, the area around infected elm trees can be trenched. If less than 25 percent of a tree crown is damaged by DED, then severing root grafts is a viable management option. These trenches should be 36 to 40 inches deep and completely encircle infected elm trees. The trenches can be refilled with soil immediately, and any infected trees should be removed as part of sanitation efforts. If more than 25 percent of a tree crown is damaged by DED, the fungus likely has moved into the roots. In that case, root pruning cannot save the adjacent trees. NOTE: Before trenching, call North Dakota One Call, (800) 795-0555 or 811, to ensure that all underground utility lines are clearly marked. Fungicides. Fungicide injection may prevent the fungus that causes DED from infecting healthy elms. Two active ingredients, thiabendazole and propiconazole, are registered for controlling the fungus. These chemicals need to be injected directly into the tree root flares by a trained tree care professional. Fungicide injections are labeled for preventative and therapeutic treatment but are less effective if the tree already is infected. Fungicides cannot control root graft infections. Fungicide protection against DED may last for three years. Note that while fungicide injection is extremely effective at preventing DED infection, repeated injections can cause irreversible damage to trees and phytotoxicity can occur under certain conditions. Fungicides need to be used in combination with sanitation to be effective in reducing DED. Resistant Varieties. 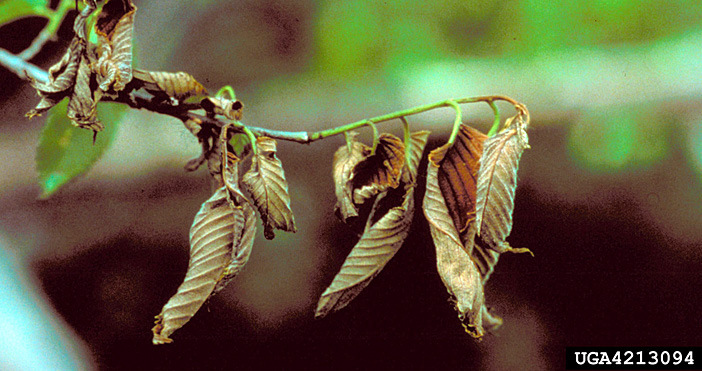 No species of elm is totally resistant to DED. However, a large amount of variation occurs among species of elm trees. For example, the American elm (Ulmus americana L.) is the most susceptible, and the Siberian elm (Ulmus pumila L.) is the most resistant. Many DED-resistant American elm selections, as well as exotic elm species and hybrids, are available commercially. Contact your local county Extension agent or arborist for a list of the current DED-resistant cultivars. Insecticide Control. Insecticides can be used as a preventive treatment to kill adult beetles prior to transmitting the DED spores to uninfested trees. However, we do not recommend this technique because multiple applications would be necessary due to the prolonged flight periods and various emergence patterns of the different species of elm bark beetles. Other management techniques mentioned above, such as sanitation and fungicide injection, are more efficient and cost effective for the control of DED.